Vernon Volumes: Appendectomy for Mommy! This last week's been pretty rough. 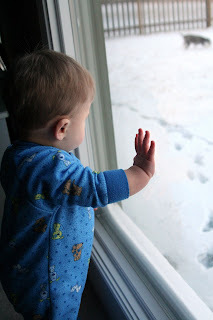 Andrea woke up at 1:30 a.m. Sunday morning with sharp pains in her abdomen. Our friend Luke recently had the same symptoms, and he ended up having an appendectomy. We considered it might be a possibility since Andrea was having the same symptoms, but we really didn't think that's what it was. To be on the safe side, everyone got up in the middle of the night and went in to the Emergency Room. Andrea's been pretty sore since then, and can't lift anything heavier than 10 pounds. Connor weighs more than double her limit, so it was Grammy Genie to the rescue. Grammy Genie and Grandpa Garry drove up from Odessa in the middle of the night to take care of Connor during the surgery, and Grammy Genie stayed with us for the last three days to help take care of everyone. Thanks Genie! We appreciate everything you do! A quick update on Connor, he has been in a great mood recently. He's been very vocal recently, and has been into everything. He's definitely a busy body. He has gotten very good at pushing his car around the room, and Grammy Genie even said that he let go of the couch momentarily and took a few steps unsupported before grabbing onto her leg. 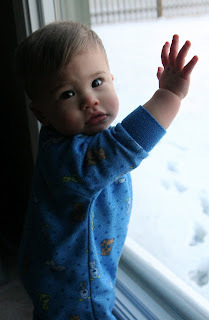 The weather's been crazy the last few days, he loves to stand up and bang on the window. When Chloe's in the yard, he likes to watch her do her business. we hope Andrea's recovery is complete, we're certainly thinking of her. 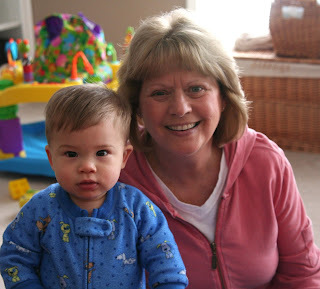 hope also that Connor took good care of Mommy...with Grammy Genie's tremendous help. My little man is growing up. Not much longer and he will be walking on his own. I can't wait! Yeah! It's nice to have family nearby. We didn't have that luxury when you kids were growing up. You are very lucky. Thanks Grandma and Grandpa Anders for watching over that nice family. Wish we could be closer. Speedy recovery Andrea. Watch out for little walking man.